The Data Center CFD Export for AutoCAD add-in is used to define the various components in the data center that can be directly imported into CoolSim to speed up the CoolSim model creation process. There are two methods for defining objects, “Diagonal Opposite” and “Internal Selection". If the AutoCAD object has been created as a closed polygon to define the object, then the Internal Selection method can be used. To use this mode, the user simply uses their left mouse button (LMB) in the center of the polygon to select the object. In cases where the polygon is not continuous, such as most room definitions, then the Diagonal Opposite method is used. To use the Diagonal Opposite mode, the user selects the upper left corner of the room with their mouse (LMB) and the lower right hand corner (LMB). At this time, the Data Center CFD Export for AutoCAD supports only rectilinear rooms. Other types of rooms can be made within the CoolSim application. To uninstall this plug-in, click Control Panel > Programs > Programs and Features (Windows 7/8/8.1/10) or Control Panel > Add or Remove Programs (Windows XP), and uninstall as you would any other application from your system. 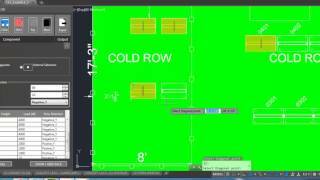 Data Center CFD Export for AutoCAD will export a file that can be imported into CoolSim. If you do not have a copy of CoolSim, but would like to evaluate the CoolSim application for your data center modeling or management needs, please contact support@coolsimsoftware.com. Supports AutoCAD 64 bit versions 2015, 2016, and 2017. AutoCAD undo command will not work while using the Add-in.